Meet Thembinkosi Jeffrey Nxiba, a developing farmer who was born at Hlankom Village, about 25 km from Maclear towards Mt Fletcher. Thembinkosi attributes his progress and success to Grain SA and this hard worker would love to be a commercial farmer in the next five years. Where and on how many hectares are you farming? What do you farm with? I farm with maize (5 ha), potatoes (0,25 ha) and pumpkin (0,25 ha) on communal land. My parents were farmers so the love for farming was instilled by them. I farm with livestock and crops and this also motivates me. I grew up in an environment where you are used as a worker but not paid for the work done. At school, I took agriculture as a subject and owned a plot in the school garden. I would sell my produce from this plot to earn my pocket money. Food shortages and the growing population have also played a part in my wanting to produce food. Strengths: I am a hard worker and have good communication skills to negotiate and get what I am targeting. Weaknesses: I do not own the land as this land belongs to the Chief. What was your crop yield when you started farming? What are your respective yields now? 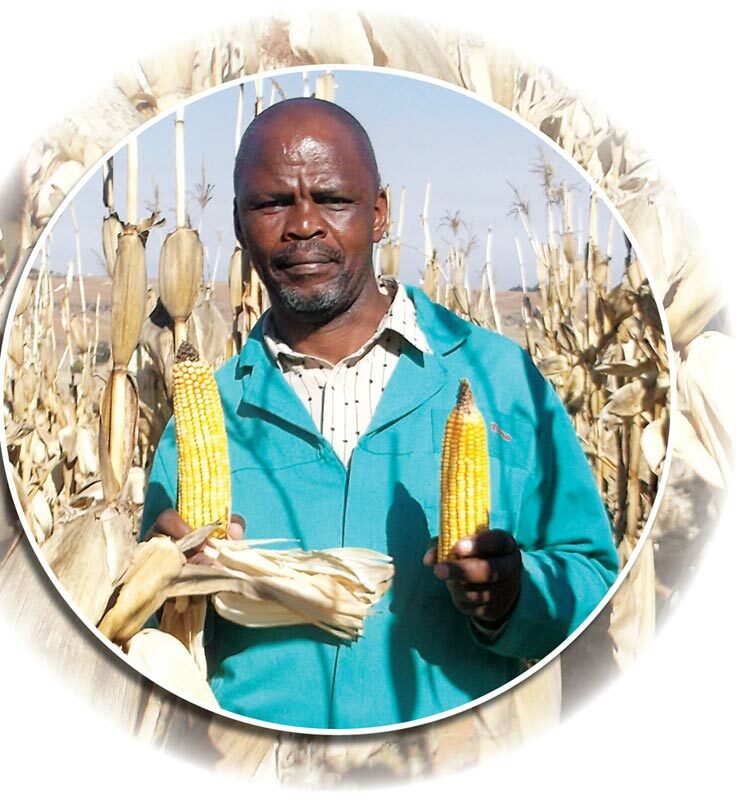 I started farming in 2006 and then my yield was around 2 tons/ha on maize. Currently my yield is 7 ton/ha. What do you think was the main contributor to your progress and success? I can attribute my progress and success to Grain SA’s training and study group visits. I have learnt about soil sampling, utilising hybrid seed, calibrating the planter for the right plant population and using the correct amount of fertiliser. I have also learnt to calibrate the boom sprayer for the right amount of the herbicide dispensed. What training have you received to date and what training would you still like to do? To date I have attended the Tractor and Implement Maintenance course, Introduction to Maize Production course and the Skills Workshop course. I would still like to receive training on Introduction to Soybeans, Sorghum and Beans as well as Resource Assessment and Planning courses. Where do you see yourself in five years time? What would you like to achieve? I would love to be a commercial farmer, owning ±100 hectares arable land and being able to produce at least 10 ton/ha. What advice do you have for young aspiring farmers? Young aspiring farmers must join Grain SA Study Groups and become members to share information and receive training so that they can be exposed to commercial farming practices. Article submitted by Vusi Ngesi, Development Co-ordinator of the Grain SA Farmer Development Programme, Maclear. For more information, send an email to vusi@grainsa.co.za.